An image of the tall public sculture we have made for Art Park Marrowijne. Dimensions are 10 meter tall and 14 meters wide. Location is at the intersection at Moengo on the East-West Highway. 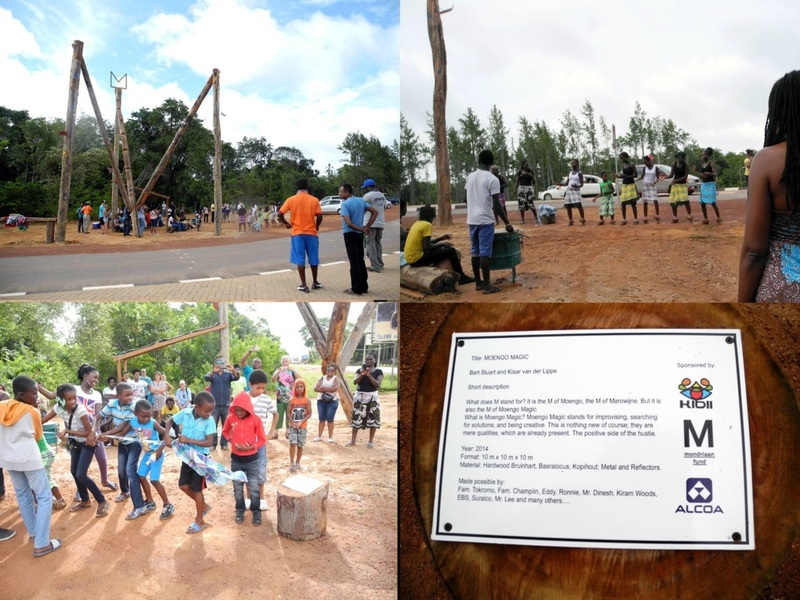 some images of the festivities during the opening of Moengo magic. We have had our opening as the closing event.We are very happy with the results and all that is achieved. It was a very good and rich period and we have made a big contribution to the Marrowijne Art Park. New 'old' souvenirs made by us. Right we have found a traditional Bangi in a remote village. 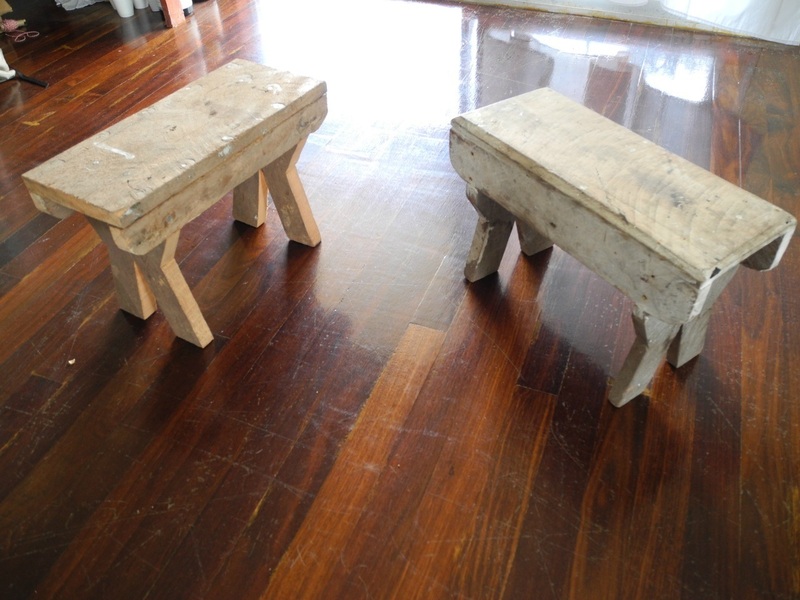 To the left we have copied it and we have made do-it-yourself kit, to make the Bangi at home. On our opening it was a big hit! A quick update on the progress we have made with our sculpture last week. 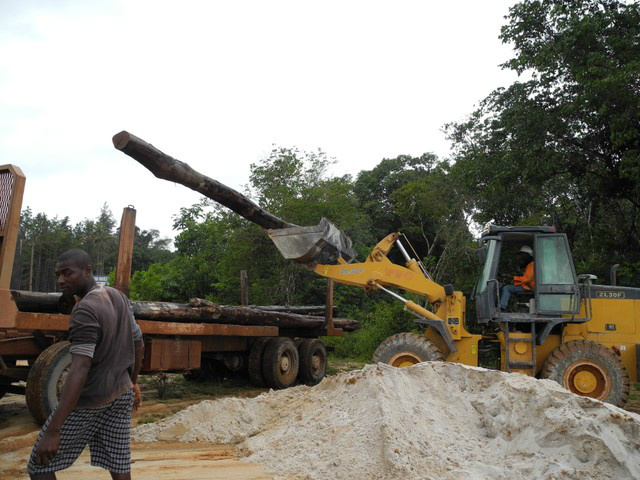 Yesterday the big tree trunks were delivered on the site. We got assistance with the yellow loader from Mister Hogedorp and mister Adipoera from Moengo Minerals. Gran Tangi!! 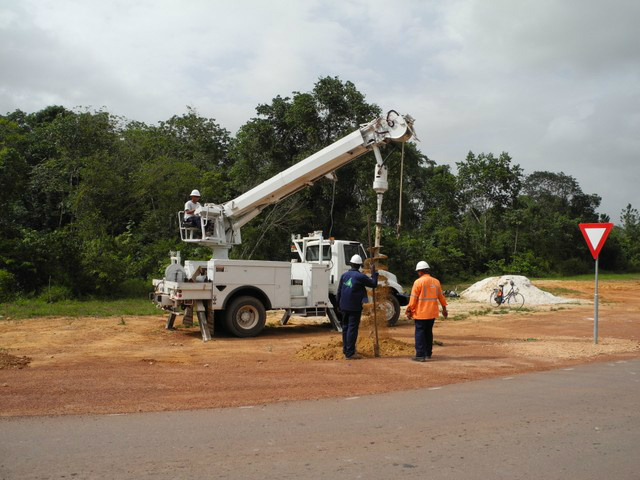 Last week we have had assistance from the Electrical Company of Suriname (EBS). We have made a floorplan of our sculpture and made a layout in the sand. They were very kind to dig four holes of two meters (6,5 feet) deep. The soil is very hard and rocky. The machine (a big truck with a hydraulic drill with a diameter of 50 cm) made it feel like a hot knife in butter.... Gran Tangi!!! 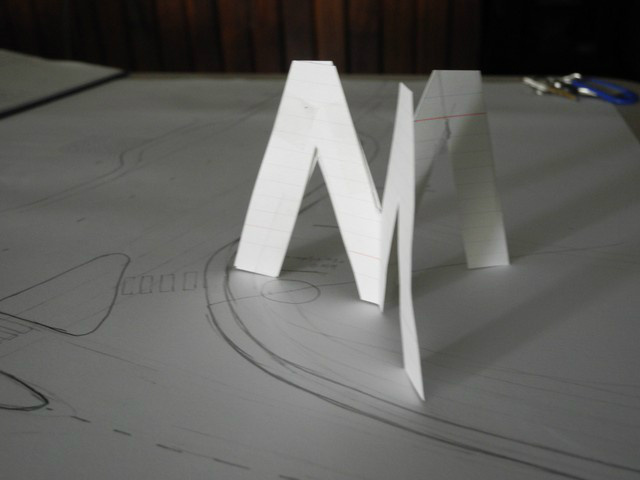 We have made a second model of our M-sculpture for the Marrowijne Art Park. It is a scalemodel 1:20. It gave us a good impression of how it looks with big logs and how to connect the ends with nuts and bolts. 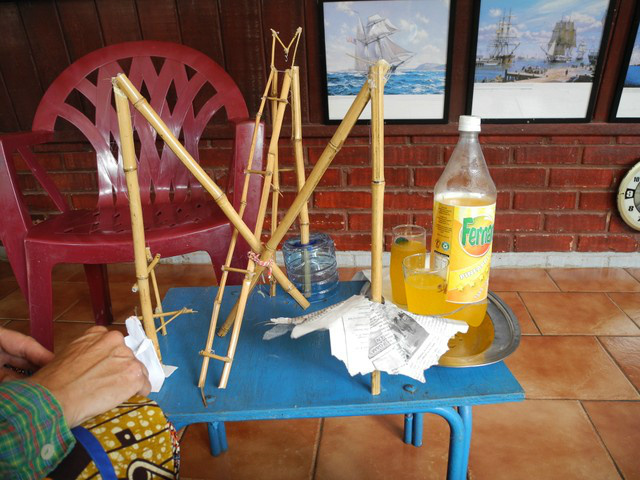 With our first model of our sculture for Moengo we have visited some local people of interest. Here we are at Mr. Lee for technical advice and feedback. His comment: A very ambitious plan!! He was not sure if Moengo deserved a work like this. Moengo Magic. With this work we focus on TOURISM. We work with the theme ‘Moengo Magic” to visualize a way of dealing with things. Moengo Magic is the positive side of the ‘hossel’ culture: improvisation, seeing opportunities, working in unconventional ways to archieve your goal, being determined to succeed. 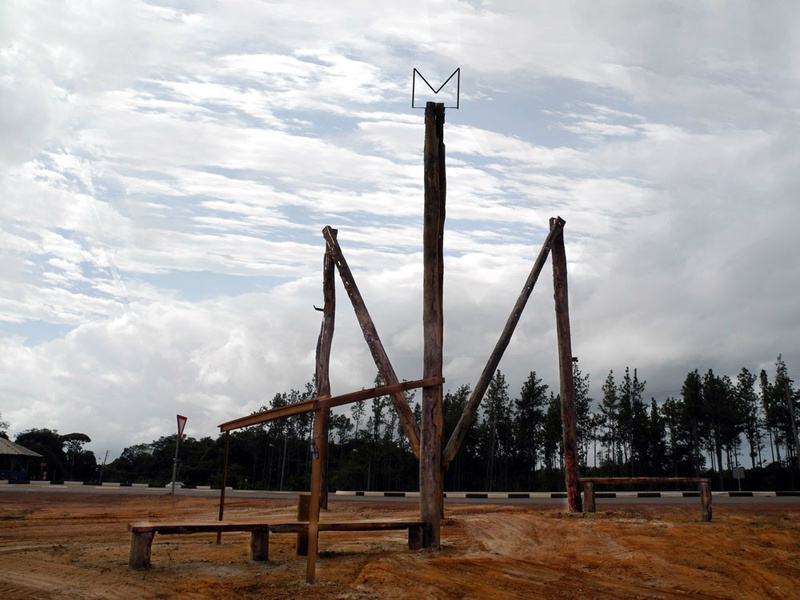 a very large M to be seen from three angles. Location is the intersection on the East/ West road, the motorway junction to go to Moengo. Why there? The old road went through Moengo but this new road passes Moengo by. The M will work as a landmark and as a token for this mentality. Our first model is in cardboard. It will be constructed from wood. 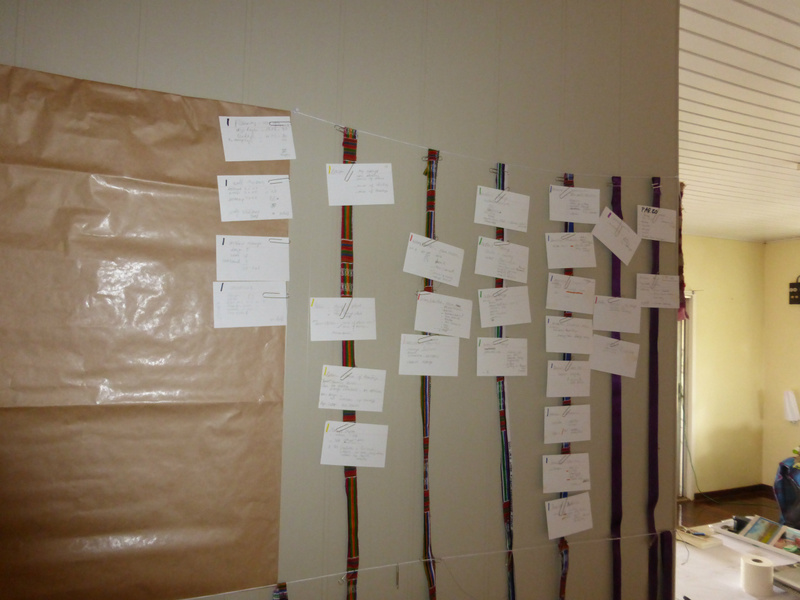 After three weeks in Surinam we have made our provisional planning. This is what we are concentrating on and the projects we are trying to get of the ground. sense of identity, sense of place, sense of heritage. Together they are part of the scales of belonging somewhere, being at home. Suriname and Moengo have something in common: both are societies created for economic purposes, both by companies with a clear cultural concept. As well in both inhabitants were imported as workers. Resulting in communities, with only the relation with the initiator in common. At this point in time, after almost a century since its foundation in 1916, Moengo faces the possible departure of the founder company SURALCO. And in a way loses its purpose since there are very few other employers. We like to investigate whether during this century a different/alternative collective identity has formed. What the concepts about communality are. And what kind of relation people feel to Moengo. Do they belong here, are they visiting, trespassing, guests, migrants in transit or are they ready to leave? As invitees of Tembe Art Studio we are part of the new invasion: the cultural class. Marcel Pinas focuses on the traditional marroon culture as anispiration for a possible new sense of identity for Moengo. 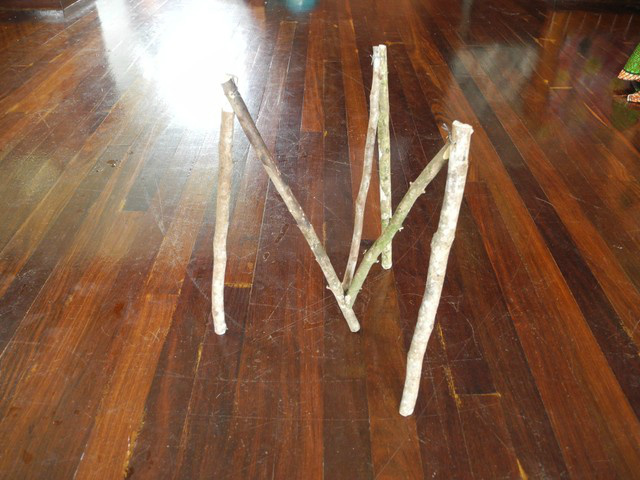 He invites contemporary artist to come and make a sculpture in the public space. Both to create a new industry, tourism, for Moengo and to re- introduce the practice of cultural traditions in everyday life. We are all for this, although we also feel a certain contradiction in terms: are we, the children of the colonial ruler best equipped to introduce a new cultural elan? On the other hand, we are experts where it comes to what the tourist expects of a ‘authentic culture’. And we do have a lot of experience in the tension between politics, economy and community. Of course teaching the children of both Moengo as the villages in the neighbourhood is a great opportunity to educate and listen and observe. For this we have written a small program, which we hopefully execute together with the next resident Klaas Burger. . When planning we found out that already time is short. So probably things will change, be skipped or condensed. As said earlier today on the local radio station B.O.B. 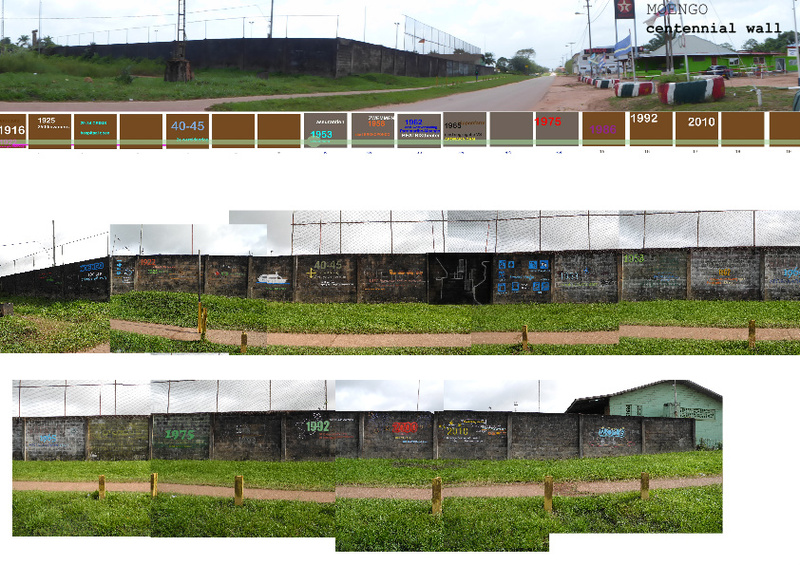 : three months in Germany is a long time, in Suriname speed of things is different…..